It's January and I haven't put an entry on since September, but I have been keeping reasonably with my painting, but having a fault with the camera hasn't helped. Anyway here's what I 've been up to, plua I've set the counters back to zero to see how my painting/buying ratio goes this year. First off I finished the Artizan cult members I picked up at the Other Partizan, along with this years free figure, Clyde. The next new game we will be trying out in 2010 is going to be Chaos in Carpathia and also Chaos in Cairo. This is the beginning of my Werewolf warband. 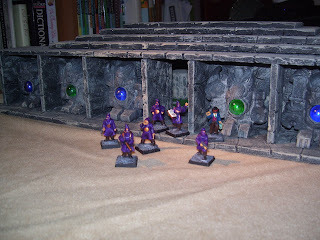 The wolves are D&D miniatures, the werewolf on the left Dr Who and the one on the right Mage Knight. One of my big projects during the past few months was to get my Eaters force ready for the annual Wargods tournament in Canterbury. 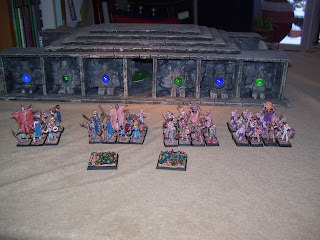 These figures will also form the basis of my Mummy warband for Chaos in Cairo. 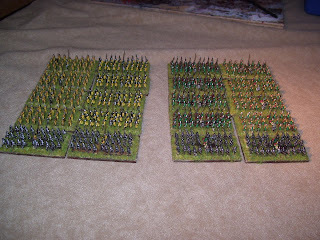 Finally the big project I've been busy with is the Towton Project, I've managed to get some more finished for this and am well on the way to finishing my first battle. Plans for the coming year include more 15mm Sci-Fi, I have some Critical Mass Game figures ready to paint, as well as some GZG aliens. 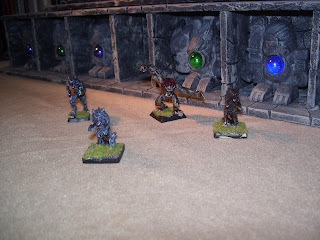 Finishing my Werewolf and Mummy warband for the Chaos games. The painting seems to be going well at the moment and I hope to have some more added by the weekend. I've decided to go away from Victory Points this year and just keep figures painted more than figures bought.